The headlines are all about the three Hollywood male superstars that are making the film: Leonardo DiCaprio, Tobey Maguire, and Tom Hardy. weapons, a heartfelt concern of all three of the actors. Hundreds of elephants are slaughtered for their tusks: image via worldwildlife.orgBut the hunters have weapons, big-time automatic machine guns and grenades. They are militias, insurgents, terrorist groups... With their weapons, elephants, rhinos, and other natural inhabitants of the African desert are no match for the hunters. They can be slaughtered easily, as they were earlier this year when 100 Sudanese 'raiders' stormed into the Cameroon Fouda NDjoda National Park and mass murdered approximately 300 elephants for their tusks. Chinese and other Asians pay dearly for the elephant tusks, the rhino horns, the tiger bones, plus the skins, the feathers, and the fur of hundreds of species of animals and birds. Like drugs and weapons smuggling, animal parts are easy money for the hunters and they use it to fund their revolutions. British actor Tom Hardy, who recently starred in The Dark Knight Rises, came up with the idea for the film, inspired by friends in the Special Forces who are now fighting the animal poachers in Africa. As conceived of now, the movie will be somewhat like Traffic, which weaved a personal story through a its serious, timely topic. Though it is unclear as yet whether Hardy, DiCaprio, or Maguire will star in the new film, Warner Bros. has decided to make it. Let's hope the film will not only shed light on the destruction of animals, but on the senseless greed that fuels this unholy business, and perhaps governments can impose sanctions on the nations that allow import of these goods.. 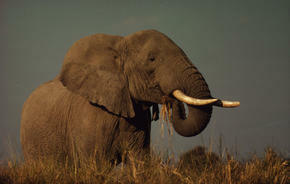 In the meantime, see how you can assist the World Wildlife Fund stop this horrible destruction. Fur Or Against: Raccoon Dogs Pawned Off As Faux Fur? Parachuting Beavers? What Else Don't We Know About The 1950s?